The alarm goes off early Sunday morning. Jason has already left for work. I hop out of bed, take a shower, and go down to turn on the coffee. The only day my little ones sleep in is on Sundays. Go figure. I go to wake them up. We eat breakfast. Get dressed. I look at the clock: an HOUR early?! Good! I set them in front of some cartoons and go upstairs to read my devotions. I sip my coffee, read, and pray. Next time I look at the clock: fifteen minutes LATE?! We rush to get our shoes. We rush to get in the car. We rush in....I settle myself in the chair and sigh. We are late, but we are here. overwhelmed (when I do too much). When it comes to serving in church, I could never say "no." I actually remember the first time I told a pastor "no" I can't do something. I was fifteen and was supposed to play the piano in the morning worship service. I started crying. Yes. Crying, right there in the front pew before church. I was asked to play a certain hymn on the piano that I couldn't play. My dad looked over at me and said, "You can say 'no,' Sarah." And I felt horrible. A little free....but mostly guilt. When I had my first son, I still was saying "yes" to quite a bit of ministry activities. By the time I had my third, I realized I couldn't keep saying yes. So, I started saying no. When I said I had to quit, I felt free. But I still felt guilty...like I was letting people down. So, I was stuck between the guilt of not serving and the overwhelmed feelings when I did serve. 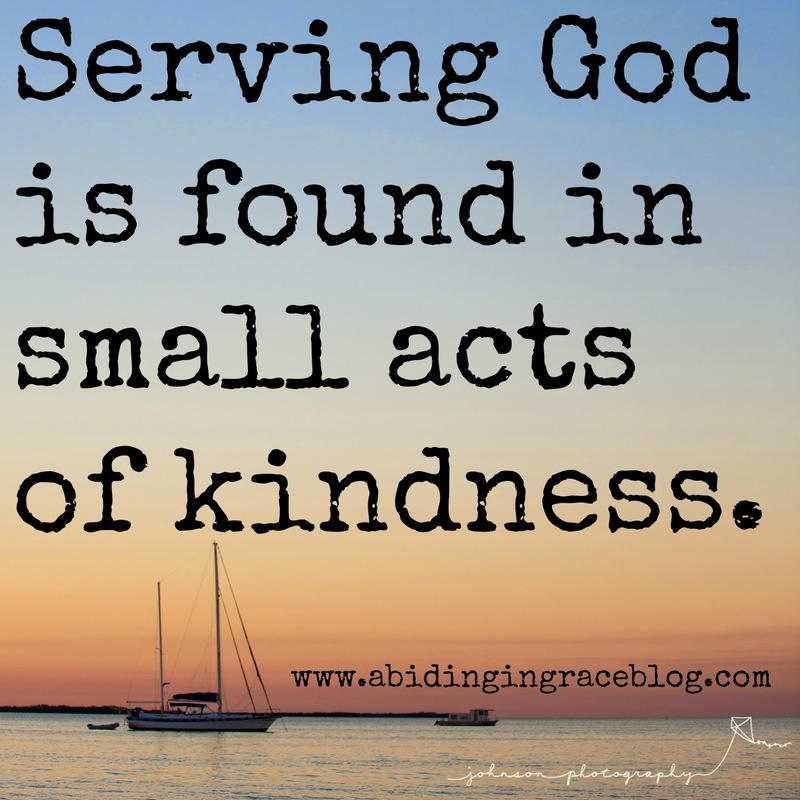 When you are in a season of life when serving in a lot of areas is just physically, emotionally, and spiritually impossible there are STILL avenues in which you can serve! 1. Sending cards and notes. 2. Having an in-home Bible study. 4. The ShoeBox ministry. - Check out their site here. 6. Sending a care package to a college student. 7. Buying a special gift for someone. 8. Giving to a missionary/mission organization. 9. Being a wife, mother, daughter, sister, friend to your family. What kind of ministry ideas do YOU have? I'd love to hear. Leave a comment below with one!